I absolutely love having fresh flowers in my home. There is just something about seeing flowers when I walk into my kitchen that puts a smile on my face. I also love when my Kroger marks down big bouquets of flowers because it give me permission to splurge and treat myself. I figured it would make a great Lilly Pulitzer inspired arrangement. Get it- Lily & Lilly?!? 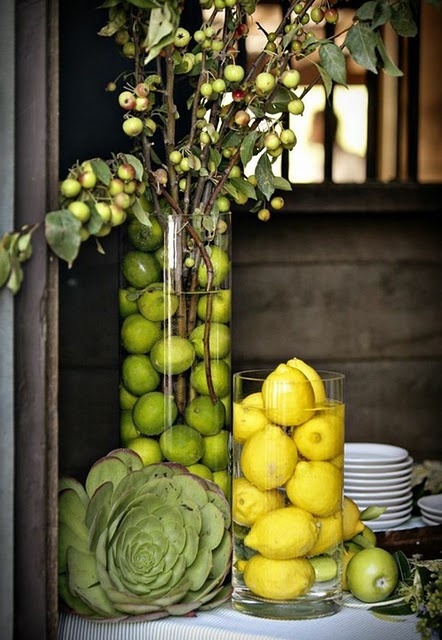 adding some citrus is the finishing touch! 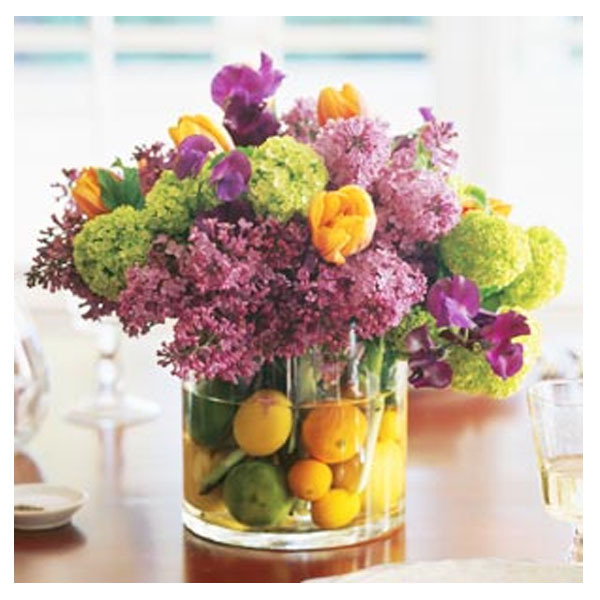 Here are my tips on how I turn grocery store flower bouquets into custom flower arrangements in 5 easy steps. 1. First, I open the bouquet and remove all of the filler greenery. 2. Then, I sort the stems by color. 3. Next, I remove any stems that are filler pieces or that don’t fit my color scheme. This bouquet also had some purple daisies and yellow carnations that I removed and used in a separate arrangement. 4. Finally, I build out the bouquet stem by stem until I get the right blend of colors and fullness. 5. For extra interest, I add rocks, shells, fruit, whatever, to the bottom to help hide the stems and give the vase a little something extra. 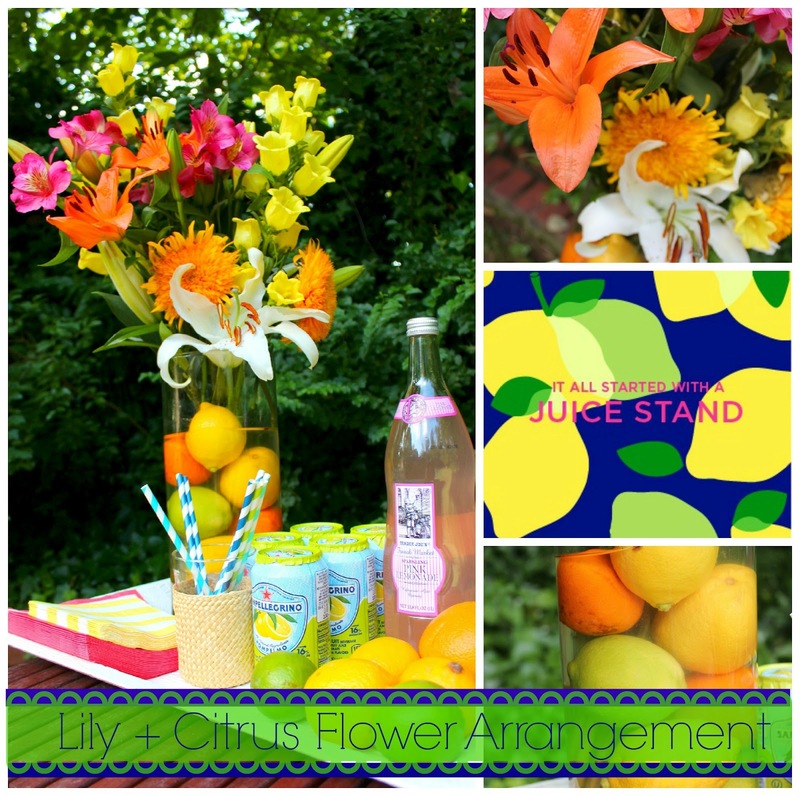 If you are channeling Lilly and want to make a citrus arrangement of your own, here are some awesome inspiration arrangements! See you next Wednesday for the Lilly Pulitzer Style Soiree! What a beautiful little display! I love it!! Thanks! I can't wait to see all of the Lilly creations! Very cool! 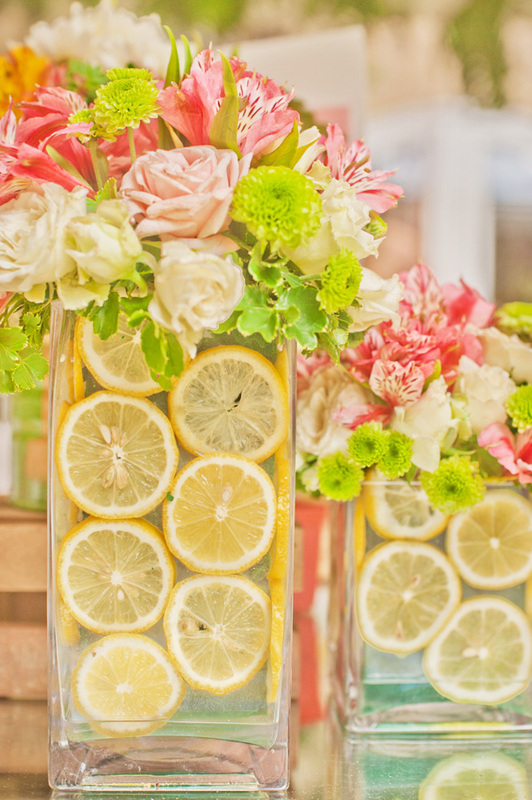 Love the fresh and preppy colors! What is the deal with me and preppy lately?! can't get enough! Thanks so much for stopping in! 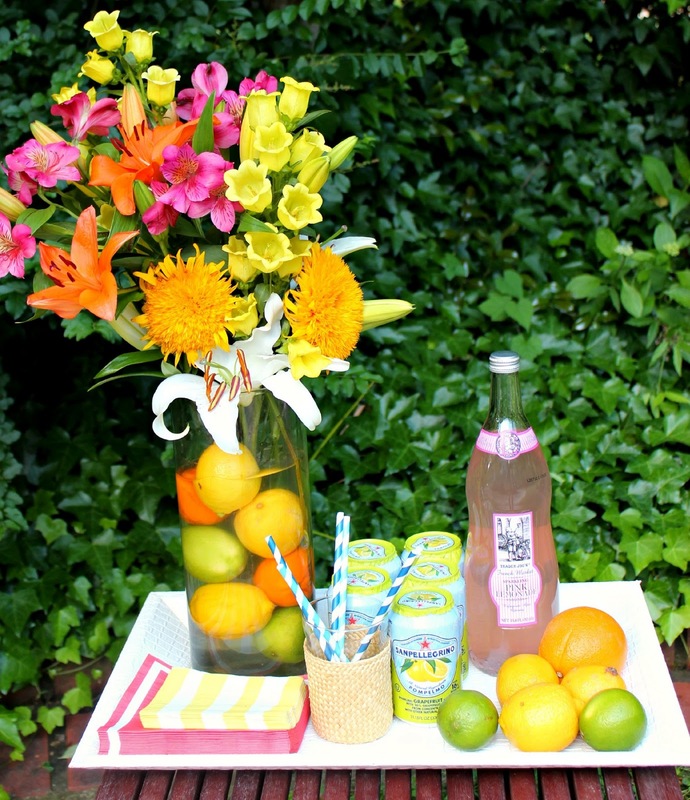 Such a cute beverage table, and I love your inspiration! 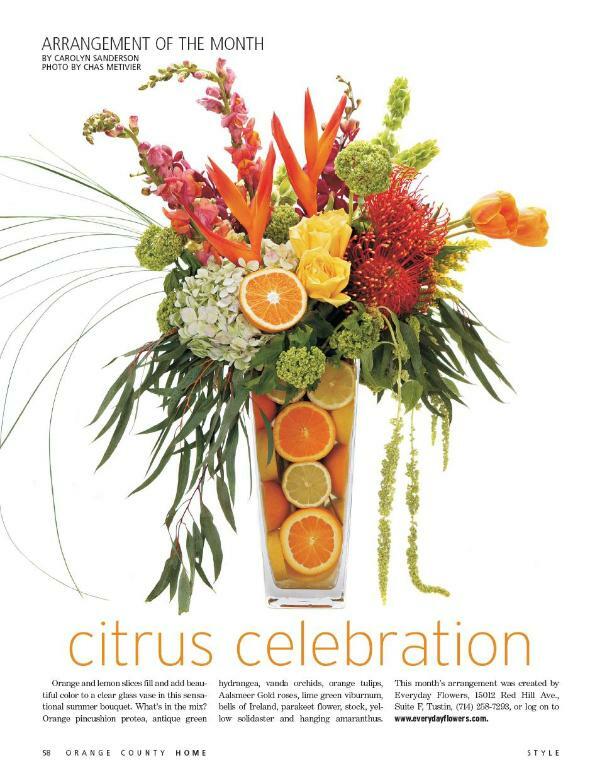 Thanks for including the others too, I'm hosting a Mexican party this summer and wanted to do citrus and flowers so these photos will all be fabulous for reference, I've pinned several including yours, thanks so much! That sounds like a fun party! So glad you found some inspiration. Have fun! What a great post in a time where many gardens (like mine) are now coming into blooms…totally inspirational! If only I could grow flowers! 😉 so glad you found some inspiration and I am always inspired by those with green thumbs! You are an inspiration! I love your flower arrangement! So pretty! 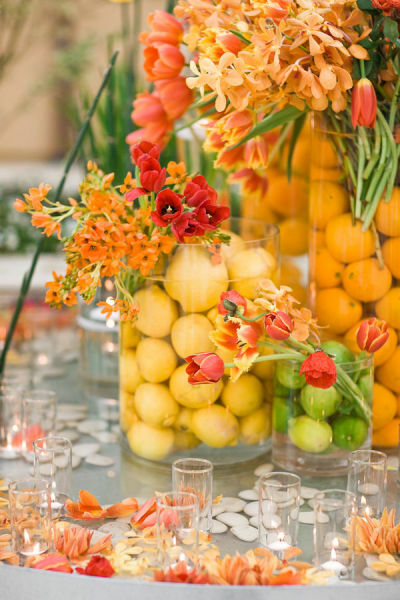 Love the display of citrus! Thanks so much for linking at Let's Dish! I think you forgot to add me to your list. Thanks. Hey there! Just updated with your link. Thanks.